My name is Nicole and I'm 15. I live in Wandlitz. That's near Berlin (Germany). 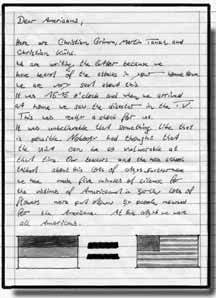 The reason why I'm writing to you is that I wanted to say that I am very sad about the things that happened on September 11th. I am really shocked about the attacks. On this day I sat in front of the TV and couldn't believe it. I feel so sorry for the people that have been involved in the attacks of New York and Washington. I don't understand that. How can people do such terrible things? I think they don't have feelings. But I think nobody can understand that. It is so senseless!!!!!! The people were unguilty! Many died or are hurt. But you know all these facts and I want to say that the whole of Germany is with you. And now I'm also having anxieties. I'm afraid of a war or of attacks in Germany. I'm a peace loving-girl and I think that violence isn't the right way. A few days after this terrible event we had five minutes where Germany was full of silence. All machines stopped and the Germans thought of you, cried for you and prayed for the victims and the families and the whole of America. At school we often spoke about our feelings and thoughts. The whole planet has changed and I'm sure I never will forget this date. I hope the families of the victims - the families that were destroyed - have a lot of strength just at this time. My name is Stephanie and I'm 16 years old. I heard about the terrible news from Washington and New York as I was in my bedroom and watched TV. The first thing I saw was a newsline on the upper side of the screen. At this moment I thought,"Mmh, the World Trade Center, now I know that ." A few minutes later my mother came into my room and said, "Stephanie, switch to the news television station." And then I saw the Twin Towers and a plane which flew in the second tower. And when I heard the newscaster speak about the third global war I was shocked and afraid. The next day, accidentally my birthday, was a surprising day. All our teachers have talked with us. But I am hopeful that everything will be all right. One day the whole of Germany made five and three minutes silence. It is so terrible what has happened there. Maybe you can write back to me and you can tell me your feelings. We are Jennifer and Mathias and we are sixteen years old. We live near Berlin. At first we want to say that we're very sad and shocked about the events in New York and Washington. It is unbelievable what had happened on the 11th of September 2001. At the first moment we couldn't believe that two airplanes flew into the World Trade Center and another into the Pentagon. The sorrow in Germany is very big and all feel with the victims of the cruel event. Two days after the terrorist attack we had made five minutes of silence at school. At that time most people cried. They couldn't believe something like this is possible. Mathias and Jennifer are writing this letter because we can't help in another way because we're too far away. To conclude we want to give you our address and hope you write back. Our names are Nicol, Anja, Doreen and Katrin. We are four German girls from the capital of Germany, Berlin. First of all we'd like to say that we regret the situation which is in your country at this moment. Our teachers and we talk about the attack all the time. Because we were so shocked, we did a five minutes silence. Nicol, Katrin and Doreen have been watching from the first moment on. And our friend Anja, who never watched any news on television has looked at it, too. We all condemn the attack on your land which is a perfect example of an independent and free country. Our English teacher thinks that we shall write a letter to an American school. And we thought that was a good idea. And we hope that we will be good friends. My name is Christoph. I am a pupil of the Wandlitz Gymnasium. 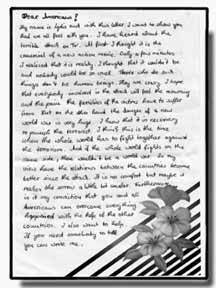 I write you this letter because of the attack on September 11th also for us has been terrible. That's why I want to express my sympathy. Sometimes after school and lunch I watch the stock market reports on N-TV. So I did on September 11th. But when I watched the TV I saw the burning of the twin towers. At this moment I thought it was a film. Some minutes later I noticed it was reality. I was very shocked. So I ran to my mother and called, " You won't believe what was happened in the USA. I told her what I had seen. My mother said it was impossible. Then we watched TV together. After some minutes we heard about the crash of a plane in the Pentagon. The fright didn't stop. It became worse. Then one after another the twin towers caved in. We sat aghast before the TV and thought. In this moment so many people innocent had died. It was unbearable. Most of all, I was occupied with the question of who can do this? Above all there is the question of what will happen now. I hope the guilty persons will be punished without taking other innocent people. Here are Christian, Martin and Christian. We are writing the letter because we have heard of the attacks in your hometown. We are very sad about this. It was 15:15 o'clock and when we arrived at home we saw the disaster in the T.V. This was really a shock for us. It was unbelievable that something like that is possible. Nobody had thought that the U.S.A. could be so vulnerable at that time. Our teachers and the whole school talked about these lots of days. Furthermore we have made five minutes of silence for these victims of Americans in Berlin.. Lots of flowers were put down by people mourned for the Americans. On this day we were all Americans. Christian , Martin, and Christian K.
We are two girls from Germany, Judith and Jasmin. We are 16-year-old students in a German high school. First of all we want to say that we know that the world changed on September the 11th 2001. It was a horrible attack which shocked the conscience of the whole world. When we first heard of the attacks we came back from school. We phoned each other when we saw the pictures on TV. We thought it's unbelievable what happened in New York and Washington. The whole day we followed the news on TV. In Europe we made 5 minutes of silence for the victims. This shows that Europe feels with the USA. We want to send a big praise to all people who were saving lives, who didn't give up hope and to the supporting ones. Our anxieties are that a 3rd world war will break out. The successions will be horrible: more violence and even more dead people because violence just produces more violence. Now is time for a good but clear answer. To conclude we want to say why we wrote this letter. We want to show our sympathy and our sorrow for the USA. I'm Kathleen and I come from Germany. My friends and I go to the 10th form of the grammar school. Our English teacher asked us if we would like to write a letter to the USA and all of us said "yes." I'm honest it wasn't easy to write this letter because I think I can't write in English very well. First of all I would like to say that I feel sad about the terrible things that went on the 09/11/01. We couldn't believe it when we heard this. I thought this was a joke. But when I had phoned my friend because I would like to ask her something, she reacted very irritably. By this time I had been realized it a little bit, but I couldn't believe that it was happening. I couldn't believe it although I saw the photos and articles in the newspaper and I watched TV the whole day. All of us spoke about this and we hoped and thought and we were anxious about the victims. I was afraid that the third world war might break out. But I think and hope that this doesn't happen. I hope nobody has lost a lovely person by the attack. Although I'm so interested in America I ask myself why people do this? Can you describe to me what you feel? Then I think I can better understand it. I find it fascinating how the stars and other people try to help you. But I think nobody of us can feel with you because nobody of us has lost a person. Yes, we see photos, read articles and watch TV but this is only a little part of what has happened. Our teachers spoke with us about this happening and tried to calm down us. All in all I hope that it won't be a world war and that something like this will never happen again. My name is Luise and I am 15 years old. At first I want to tell you how I heard of that bad news. I came home after school at about 3 o'clock in the afternoon. I went in my room, sat on my bed and switched on the TV. I watched an interview with the actors of American Pie 2. Then I heard my sister in the upper floor shouting my name. She ran in my room with the telephone in her hand and said, "Lulu, Lulu! Go to N-TV and watch the news! A plane has flown into one tower of the World Trade Center." I said, "Lovely sister, please end your joking. It's not very funny." "No! Peter said this! Please go on." Then I saw these pictures and I thought it is a really bad film. I was shocked and I couldn't say anything or show any feelings. A few minutes later my best friend Hannah called me. She had seen it at the same time as me. Then I went to her and we were 5 hours watching the news. At first I couldn't understand the whole situation. Later we went outside to go to a walk with my little sister (13). We were speaking very long about it and then we were afraid ourselves of what we were saying. We imagined how it would be if a war will come. Then the next day when I woke up in my bed I hoped that all was just a dream, but unfortunately it was true. But I had to be a little bit happy because it was a birthday of my friend (Stefanie). When I was at school really every teacher wanted to speak with us about that horrible event. We are Susi and Anja. We are in the 10th form of the grammar school Wandlitz (Germany). First of all, we would like to say that the disasters in New York and Washington are unimaginably cruel. Anja and I want to say our condolences to all those affected by the catastrophe. When we were coming back from school Anja's sister said that the World Trade Center was attacked by terrorists. At first we did not know if it was a joke or a reality because she often makes bad jokes. Because of that it seemed to us that it was a joke. In the evening we wanted to watch TV. After one minute we found out that in every program they were talking about the attack. We were very shocked. For two days we only talked about the consequences for America and our nation. By talking about this and seeing the terrible news every hour, minute, and second, the end of the catastrophe became clear. The most important factor is that we work together, otherwise the terrorists will reach what they wanted. We hope that it will end soon and won't get out of control into a world war. My name is Christina and I m writing this letter because I have heard that in Washington the Pentagon and in New York and the World Trade Center were destroyed by terrorists and I want to say that I feel with you. The day when it had happened I came home and watched TV and then I saw that a plane flew in one of the twin towers. A few minutes later a second plane flew in the other tower. It the same time a third plane flew in the Pentagon and seconds later a part of it broke in the World Trade Center. When I saw those pictures I thought it was a joke - what was there in the TV. It seems like an action film. I look at some photos of this I think: how can people do that? I hope that this isn't the beginning of the Third World War. One day after it had happened the teachers at our school didn't make as strict lessons. We talked about this fact. And on Thursday we had a few minutes silence. I hope for America that there won't more attacks by terroists in the next time. We are Isabel and Mandy from a German High School. 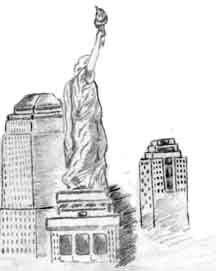 We have heard of the attack on the World Trade Center on the 11th of September and we were sad and shocked. In our eyes it is unimaginable that there are people who flew as a living bomb into the heart of New York and the Pentagon in Washington. It is very sad that so many innocent people have lost their livee because of some "sick" persons, the terrorists. Every day we saw horrific pictures of the collapse of the towers, of the hurt people and the shocked relatives. We all, the whole world, feel with you. But we think that we do not know how big the sorrow is and how your feelings are in this situation. Two days after this drama we stopped everything and thought about the disaster and we tried to feel with you in some minutes of silence. In the school we speak about this sad event and try to express our feelings and thoughts. We hope that the American government will find the people responsible for this attack and they will punish them. But no innocent people should die. We wrote this letter to show you that we are shocked and feel with you. Our biggest hope is that no war will break out and that we all can live in a peaceful world. Our names are Suen, Sebastian, Steffen and Arne. We are four friends from a German school and now, two weeks after this terror attack, we can't still believe what has happened (to your country). At first we want to say that we are mourning with the victims and their relatives of this cowardly act of aggression. We heard of this catastrophe in different ways. Some of us were surprised by special TV news, which interrupted the normal program and showed the newest pictures from New York and Washington. Others heard it on the radio. In the next days, there was just one topic in school. We spoke about it with our teachers and made some minutes of silence. We can understand your hatred and fury but we hope that it doesn't finish in a big war because many others innocent persons would die. I don't know where my letter will arrive and who would read it. My name is Ulrike and I live in Basdorf near the German capital of Berlin. I attend a grammar school. My class teacher Mrs. Nowak, my classmates and me think that the German citizens have to ask the Americans how are they and what they feel after the terrible attacks had happened. It was a cold and dull day. I was at my boyfriend's and we wanted to watch TV. But on every TV station was all the bad news. When I saw it, I couldn't believe it. You could see that many people were waving and crying. It can't be true! My friends and I were stunned and speechless! There were so many victims who were innocent and these peoples are dead now. But why? Why are they dead? In our English lesson today we looked at some magazine articles. I think it seems to be like a war. I looked at one photo and I could see ruins. But it wasn't any ruins. It was the rest of the World Trade Center. I want to say to you that I feel with you. New York isn't the New York it was before. And Washington isn't the Washington it was two months ago. Everything is different. Nothing will be like before. Nothing. Never. On Wednesday, the 12th September, our teachers talked with us about New York and Washington D.C. They were shocked, too and couldn't believe it. We have the same opinion. Despite the fact that no one really knows it exactly, everybody thinks that Osama Bin Laden is one of the evil terrorists. I really hope that everything will be brought in to prison! With best wishes, hopes and sympathy agreed!! My name is Lydia and with this letter I want to show you that we all feel with you. I have heard about the terrible attack on T.V. At first I thought it was a commercial of a new action movie. After only a few minutes I realized that it is reality. I think that it couldn't be and nobody could be so cruel. People who do such things are not human beings. They are crazy. I hope that everybody involved in the attack will feel the mourning and pain the families of the victims have to suffer. But on the other hand the danger of a new world war is very huge. I know that it's necessary to punish the terrorists. I think this is the time when the whole world has to fight together against terrorism. And if the whole world fights on the same side, there wouldn't be a world war. In my view the relationships between the countries has become better since the attack. It's no comfort but maybe it makes the sorrow a little smaller. Furthermore it is my conviction that you and all Americans can overcome everything that happened with the help of other countries. I also want to help. If you need somebody to talk to me you can write me. We are four boys from a grammar school near Berlin. We all heard about the horrible things that happened in Manhattan and we wanted to show you our sympathy to all of you. We all are shocked and afraid of the things that could come. When we first heard what happened we all thought it is a joke, but we soon realized that it was reality and spent the whole afternoon in front of the T.V. It was here on all TV and radio programs. Although, nearly all Americans think it is time for a war, we hope that a new world war won't break out. It is a pity that so many people all over the world only think on military solutions. In our opinion Osama Bin Laden shall get a sentence. We all are sure that Osama Bin Laden was involved in those attacks on New York and Washington but none can prove his guilt. I want to write you what I'm thinking about the attack on the World Trade Center, what I feel and what I hope. Surely you get a lot of letters like this, so you don't have to read this, if you don't want to. At first something about me - my name is Hannah. I'm 15 and go to a grammar school near Berlin. At the moment, I don't know how to find a beginning. It was Tuesday. I was at home at about 3 pm. At first I ate something and then watched TV. I switched from one show to another and suddenly there was a news show, but there should be a game show. I knew! The woman in the studio said something about the World Trade Center and a big catastrophe and then I saw the first pictures. I was shocked, deeply shocked. I switched to N-TV, you know? It is only a news show the whole day. They showed pictures from BBC. I couldn't do anything, I couldn't move. Then my best friend phoned me and the sound of the telephone picked me up from my thoughts,. After it, she went to me and we watched together the news,. Then we went out, sat down together with her sister. We were silent for a minute. A few days later in school all pupils and teachers were silent for 5 minutes. All the nation did this. Another day we did it again for 3 minutes. I think it's a good way to show our sympathy. What are you thinking about the future? Do you think it's going to be a new world war? I'm afraid of this? A lot of friends of mine are in the age to be moved in the army. And our chancellor said we are forced to help because of being in NATO. What are you thinking about this? I hope you could a bit understand me. Good wishes to all of you for the future. I would be very happy if someone answers me.